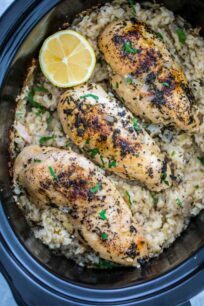 Crockpot Chicken and Rice is easy to make, healthy, creamy and a family favorite during busy weeknights. 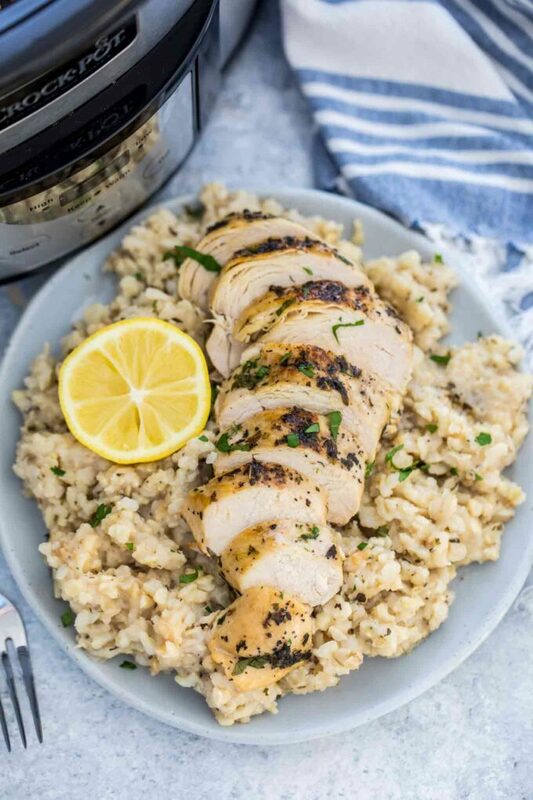 Made with real ingredients like brown rice, chicken breast, and lemon, this home-cooked meal is delicious, gluten-free and kid-friendly. With this easy recipe, you let the slow cooker do all the work for you and the end result is a perfectly satisfying meal. Crockpot recipes are a family favorite on around here, they are such a time saver during busy weeknights. We highly recommend you try some of our most popular ones: the soul-warming Slow Cooker Baked Potato Soup that is perfect for cold weather. This Chicken Tortilla Soup is packed with heat and full of protein, while these French Dip Sandwiches are always a crowd pleaser. 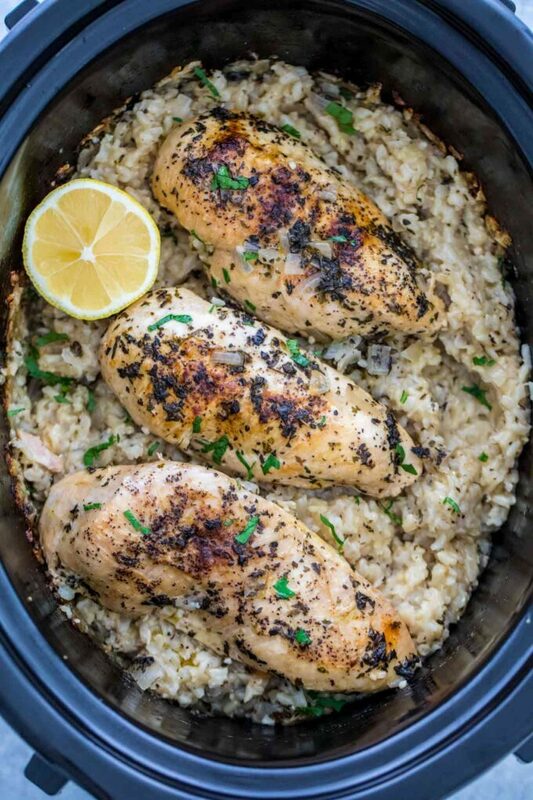 Crockpot Chicken and Rice is made with simple and easy to find ingredients. We love this meal, because its made with healthy brown rice, that is very filling and creamy from being slowly cooked. The rice has the most refreshing flavor from the lemon juice and lemon zest, that will remind you of a healthy Mediterranean inspired meal. The meat is extra tender and juicy, nicely browned to lock in all the flavors. We have kept the seasoning simple with just basil, oregano and some parsley. The flavors are not overpowering and pair so well with the refreshing citrus aromas. Do not expect the rice to be fluffy, in this dish, it is creamy and filled with all the moisture from the broth and the seasoning that was added. It is still chewy and resembles in texture a perfectly cooked casserole. We recommend you try this recipe with brown rice as we made it, it truly is delicious. Can you put rice in a slow cooker? You can cook rice in the slow cooker, but it will not have the fluffy, crumbly texture as when cooked in a pressure cooker or on the stove. While it will be extra delicious, it will have a creamier texture, like in a casserole. You will have to use a 2 to 1 ratio, about 2 cups water to 1 cup rice. If you already have liquid in the slow cooker, take it into consideration when adding in the rice. HOW LONG DOES IT TAKE TO COOK CHICKEN BREAST IN THE SLOW COOKER? You can cook the breast on high for 3-3.5 hours or low 4-6 hours. For best flavors, we recommend that you brown it before slow cooking it. Can you put raw chicken in a slow cooker? Yes, you can, but we recommend you brown it first. After that, cook it per recipe direction. Always check if the recipe asks for cooked or raw poultry. Cooking frozen poultry in a Crock-Pot is considered to be unsafe. Food Safety guidelines state that you should always thaw meat or poultry before putting it into a slow cooker. However, if you have a pressure cooker, you can easily cook the frozen poultry or meat in it. Stock – it tends to be made more from the bony parts of the bird, because of that it has a richer, fuller flavor. Broth – is made more out of the meat parts. To lock in all the flavors, it is best to brown the chicken before adding it to the slow cooker. You can use breasts or thighs for this recipe. Preferably do not rinse the rice for this recipe in order to better control the liquid to rice ratio. Next, add the rice and the rest of the ingredients to the pot and top with the chicken. Always cook on high when cooking rice, if you choose the low setting, it will end being extra mushy. The meat may end up being ready before the rice is, check after about 3 hours and if its internal temperature reached 160 – 165 degrees, you can remove it to a plate and cover with foil. Taste the rice, and if it’s still too chewy, stir and continue to cook a bit longer. Crockpot Chicken and Rice is easy to make, healthy, creamy and a family favorite during busy weeknights. Season chicken liberally with salt and pepper on both sides. Place a large skillet over high heat, add oil and once its hot add the chicken and brown it on both sides for about 5 minutes. Add the rest of the ingredients to the crockpot, stir to combine and place the chicken on top. Cook on HIGH for 2.5 to 3 hours. Check on the rice after 2.5 hours, and if it needs more time, stir and continue to cook. I love a good slow cooker meal! Such an easier way to get this delicious meal on the table. 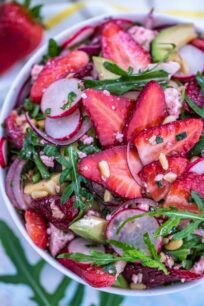 The flavors are amazing and super easy to prepare! Crockpot meals are amazing and this is no exception !! They are so convenient and make enough for a big family! Slow cooker meals are perfect for busy days! My family loves this one! Fuss-free and delicious, that’s the kind of meal I like for busy weeknights! Exactly, the perfect recipe for busy cooks. Crockpot meals are the BEST!! This sounds SO delicious! I love a good and easy crock pot recipe! 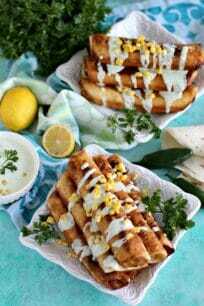 This is seriously making me hungry! YUM!!! I love this delicious version!!! This is so simple. 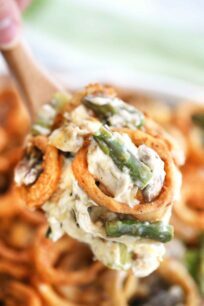 Such a great easy weeknight meal!